Want to get your recording setup moving in a big way? 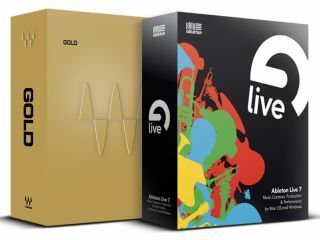 Waves has teamed with Ableton to offer their the software collections of Waves Gold Native and Ableton Live 7 together as a single low-priced package. Waves's Gold Native brings a wealth of signal processing power to users's studios, geared toward tracking, mixing and mastering. The Gold Bundle now features over 20 plug-ins, including Waves Tune LT, IR-L Convolution Reverb and Doubler, as well as many other highly sought-after processors developed by Waves. With dynamics processing equalization, reverb and more, Waves Gold Bundle is a comprehensive yet intuitive introduction to the power of Waves. Ableton Live 7 is a uniquely powerful sequencing, recording and mixing environment. With built-in software instruments, REX and ReWire support and real-time time stretching, Live 7 is fast becoming the host of choice on stage and in the studio. A number of other features further bolster this powerful software for all facets of music creation. Special note: The Waves/Ableton software package includes the FULL version of Ableton Live 7, not Ableton Live LE, and upgrades to Ableton Suite are available. The Waves Gold Native and Ableton Live 7 bundle will available for a list price of $1,500.00US, and only in the US, Austria and Switzerland only. For more information, visit the official Waves website.